Watch the DO2 RapidWrapper video! Multi Roll Loading and In-line Print Labelling! Why is automatic lumber wrapping the right choice? InterWrap is confident we have a superior solution to offer the marketplace for automated lumber package wrapping and printing of label information directly onto WeatherPro lumber wrap. The DO2 RapidWrapper is the logical answer to today and tomorrow’s requirements for automation without forsaking quality of lumber wrap. Today’s modern wood manufacturers are demanding automatic solutions for streamlined production and increased safety. The DO2 RapidWrapping System has been specifically designed to meet and exceed these requirements with the use of superior strength WeatherPro lumber wrap and ZeroDowntime™ built-in production capabilities. ZeroDowntime™ - wrapper works in fully automatic and semi-automatic modes! WeatherPro's tear strength is 6x stronger than blown film! The DO2 RapidWrapping System is the most cost effective automatic solution that is designed to use the packaging industry’s most reliable, proven strength WeatherPro® woven polypropylene lumber wrap which is 100% recyclable. Whether you are shipping across town or across the continent, the interwoven polypropylene tapes sealed inside layers of advanced polymer coatings will provide the protection your packages need to arrive looking mill fresh. Tailor made multiple width roll loading! Yet another great feature on the DO2 RapidWrapper is the “Multiple Width Roll Loading” option. This tailor-made feature gives you the flexibility of preloading multiple rolls (as many as required) of varying widths and change on the fly! Fully automatic in-line inkjet label printing system! Another unique time and cost saving feature of the DO2 RapidWrapping System is the optional patent pending PRO WrapPrint in-line printer. You can now print your label information and anything else you wish directly onto WeatherPro woven lumber wrap! Furthermore, the PRO WrapPrint system can be instantly updated, no more label re-orders or labels falling off packages! Water spray and dry chemicals. Not sensitive to impact nor to static discharge. Avoid contact with skin. Excessive exposure may cause irritation to eyes, nose, throat & skin. Prolonged and repeated skin contact may cause skin irritation. Wash thoroughly with soap and water. If redness or irritation develops, obtain medical assistance. Flush with water for at least 15 minutes. Obtain medical assistance. Drink liquids. Obtain medical assistance. Disorders or diseases of the skin, eyes, respiratory tract or allergies. See your local authorities for disposal instructions. 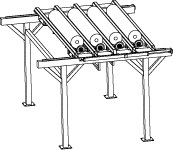 Rolls should be adequately restrained to prevent shifting during handling and storage. This information is furnished without warranty expressed or implied, except that it is accurate to the best knowledge of InterWrap Inc. The data on this sheet relates only to the specific material designated herein. InterWrap Inc. assumes no legal responsibility for use or reliance upon this data.